The Cherry Creek neighborhood of Denver is where local residents and visitors go to shop at the best stores and eat at the finest restaurants. It’s no coincidence that you also will find some of Denver’s most beautiful and valuable homes in this part of town. Located about four miles from downtown, around 1st, 2nd, and 3rd Avenues, from University to Steele Street, Cherry Creek has plenty of allure for home buyers. First and foremost, this neighborhood is known for having some of the best shopping in the West. In fact, many like to say that it is the number one shopping destination between Los Angeles and Chicago. Cherry Creek North is home to more than 300 independently owned shops, ranging from boutiques and galleries to spas, restaurants, and much more. Here, you will find an invigorating 16-block retail paradise that always gives you something to do. Many famous upscale brands can be found at the Cherry Creek Shopping Center. Tiffany & Co., Louis Vuitton, and Neiman Marcus all have their own shops here, and they are surrounded by more than 150 other quality retailers. Beautifully manicured parks and gardens, tree-lined streets, and public art give Cherry Creek a special charm that can’t be found anywhere else. It matches well with all of the local bakeries, outdoor cafes, and coffee shops in the area. With easy access to the 22-mile course of the Cherry Creek Bike Path, you can stay in shape in spite of all the tasty neighborhood treats. Its proximity to downtown and its unmatched luxury and charm make Cherry Creek one of the premier Denver neighborhoods. 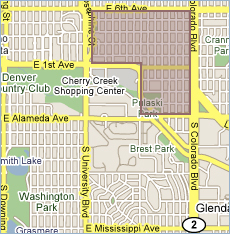 If you are ready to search for Cherry Creek real estate, talk to the Neir Team. Call Stacy Neir at 720.280.3004 or Alex Neir at 720.935.4399 for a successful Denver real estate search!